The music of ancient Greece was inseparable from poetry and dancing. It was entirely monodic, there being no harmony as the term is commonly understood. ..... Click the link for more information. ), the Pythagoreans elaborated a theory of numbers, the exact meaning of which is still disputed by scholars. Briefly, they taught that all things were numbers, meaning that the essence of things was number, and that all relationships—even abstract ethical concepts like justice—could be expressed numerically. They held that numbers set a limit to the unlimited—thus foreshadowing the distinction between form and matter that plays a key role in all later philosophy. The Pythagoreans were influential mathematicians and geometricians, and the theorem that bears their name is witness to their influence on the initial part of Euclidian geometry. They made important contributions to medicine and astronomy and were among the first to teach that the earth was a spherical planet, revolving about a fixed point. At the end of the 5th cent. B.C. the Pythagoreans were forced to flee Magna Graecia when people grew enraged at their interference with traditional religious customs; many were killed. 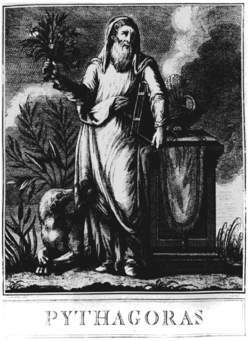 A short-lived Neo-Pythagoreanism developed at the beginning of the Christian era; it borrowed some elements from Jewish and Hellenistic thought and greatly emphasized the mystical element in Pythagorean ideas. An illustration of Pythagoras, considered by some to be the first pure mathematician. From Jacopo Guarama, 1792. Reproduced by permission of Fortean Picture Library. Pythagoras, a Greek philosopher, mathematician, and astronomer, lived from approximately 580 to 500 b.c.e. Pythagoras was the first to conceive of the heliocentric theory of the universe (the notion that Earth and the planets revolve around the Sun), a notion that did not catch on until Copernicus. Pythagoras and his followers also developed basic mathematical notions, such as the concepts of equation and proportion. Pythagoras is said to have searched widely for wisdom and is believed to have introduced the idea of reincarnation to the Western world. One of his teachings regards the “music of the spheres,” the notion that the intervals between the planets correspond to musical tones and that the movements of the planets produce an ethereal music. Pythagoras’s significance for astrology is that he clearly formulated the notion that the human being is a miniature version (microcosm) of the larger universe (macrocosm). The microcosm and the macrocosm are linked by—and affect each other through—certain correlations. This notion is basic to ancient astrology. Born circa 570 B.C. on the island of Samos; died circa 500 B.C. Ancient Greek thinker, religious and political figure; founder of Pythagoreanism. It is difficult to separate the meager facts about the life and teachings of Pythagoras from the legends that represent him as a demigod, perfect sage, heir to the knowledge of antiquity and the Near East, thaumaturgist, and magician. Pythagoras left his native Samos in protest against the tyranny of Polycrates. He may have visited Egypt and Babylonia during his travels—recent writers have suggested that Pythagoras was initiated into various secret doctrines of the Eastern priests. At a mature age (according to tradition, at 40), he settled in the southern Italian city of Croton, where he founded a strictly closed society of his followers, who already during his lifetime venerated him as a higher being. The doctrines and discoveries of Pythagoras that were preserved in the oral traditions of the Pythagorean society cannot be separated from the ideas of his followers, who often ascribed to him their own intellectual initiatives. In mathematics, Pythagoras is credited with the systematic introduction of proofs into geometry, the construction of the plane geometry of rectilinear figures, the origination of the theory of similitude, the proof of the theorem that bears his name (the Pythagorean theorem), and the construction of certain regular polygons and polyhedrons. Also associated with Pythagoras are theories of odd and even numbers, prime and composite numbers, figúrate numbers, and perfect numbers and theories of arithmetic, geometric, and harmonic proportions and means. Diels, H. Fragmente der Vorsokratiker, 9th ed., vol. 1. Edited by W. Kranz. Berlin-Neuköln, 1960. Chapter 14. Iamblichus. De vita Pythagorica. Edited by A. Nauck. St. Petersburg, 1884. Diogenes Laertius. Lives of Eminent Philosophers, vol. 2, London-Cambridge (Mass. ), 1958. Book 8, sections 1–50. Kerényi, K. Pythagoras und Orpheus, 3rd ed. Zürich, 1950. (Pythagoras of Samos, Ionia; about 569-475 BC) The Greek mathematician who founded a philosophical and religious school in Croton (now Crotone) in southern Italy. Pythagoras is most famous for Pythagoras's Theorem but other important postulates are attributed to him, e.g. the sum of the angles of a triangle is equal to two right angles.